Our award-winning luxury adventure tours have been rated as one of the top travel experiences in the world - and it's your turn for the next adventure! Tours are comprised of (14) people maximum per tour led by a local Italian Native PhD in Italian history. Every person has his or her own scooter to ride if they wish. These luxurious and newly restored 14th century private Villas come with your very own set of 2 Vespa scooters allowing you to be your own tour guide! One of the joys of driving your Ferrari is that your time is your own. 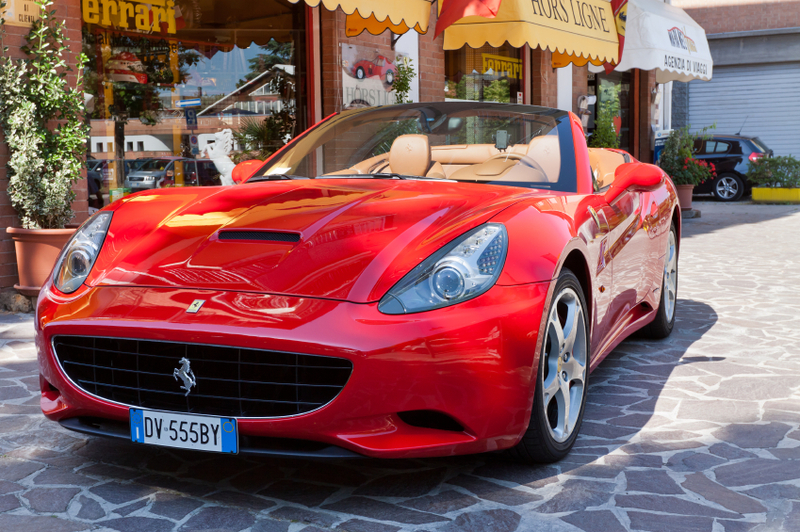 Follow our guide driving your Ferrari through Tuscany. Would you enjoy a round of golf each day before setting out? Or a moonlit boat ride? Only your imagination can set the scene. Become a traveler - not a tourist! Chianti on a Vespa scooter tour; two Italian classics which symbolize la dolce vita. Now, Italy by Vespa is bringing them together in a once-in-a-lifetime travel experience in Italy that promises to capture the heart, soul and essence of Italy: a week in central Tuscany staying at one of our luxury 4 star hotels such as Relais Vignale. 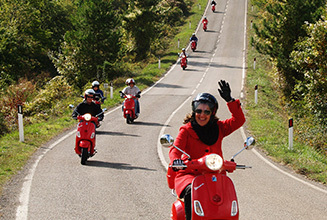 The tour is filled with adventure and scenic day trips throughout the Chianti countryside aboard your very own Vespa! Your tour guide is a local Italian native, English speaking, PhD in history, etc. We have been guiding our luxury Vespa tours in Italy for the past 20 years and winning international awards for our luxury adventure service! Past clients LOVE our guides! These are fun, youthful and active people with a passion for history, and the professional degrees to back it up. 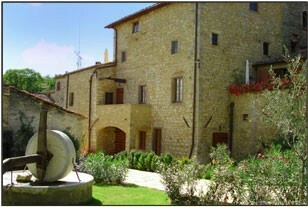 Book up to 7 nights accommodations at one of our 4 star hotels in Radda in Chianti. View videos of where you will travel and stay! Get just a taste of the vacation of your dreams. "In Roman Holiday, Audrey Hepburn inspired generations of moviegoers to fantasize about a Vespa trip in Italy. Problem was, nobody offered such a thing. Now Italy by Vespa brings Hollywood to life with a weeklong whirl around the Tuscan countryside atop a bright red scooter. Days are spent visiting castles, hobnobbing with countesses, and lunching at wineries. For fashionistas, there's a visit to designer Salvatore Ferragamo's estate and a stop at the Prada outlet in Montevarchi."